What is this alternative to suspension, and does it really work? Schools and teachers dealing with behavior issues and bullying are constantly searching for new and effective ways to handle it all. One concept that’s been making headway in recent years is restorative justice. But what is restorative justice, and what does it take to make it work in schools? 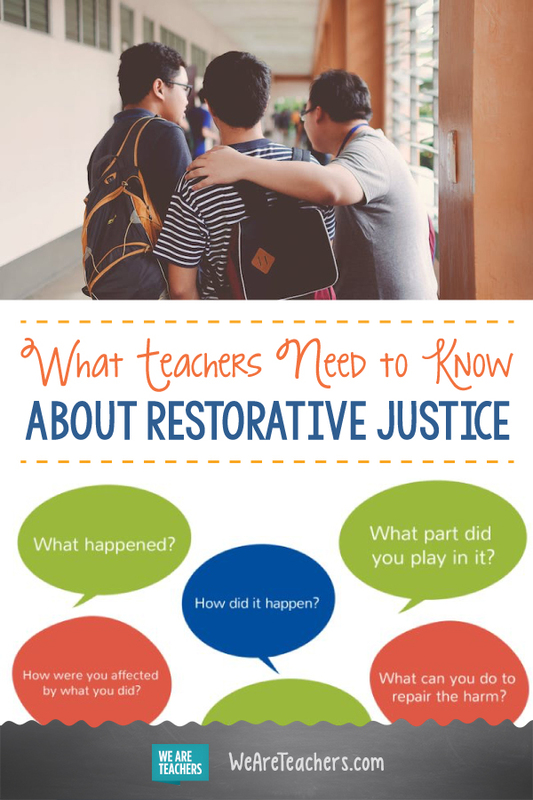 Here’s an overview of the restorative justice system for teachers and schools. Restorative justice is a theory of justice that focuses on mediation and agreement rather than punishment. Offenders must accept responsibility for harm and make restitution with victims. The concept has been around for hundreds of years, with indigenous people, like the Maori, using restorative justice successfully in their communities for generations. In the late 20th century, restorative justice gained traction in the US and other countries as various groups sought to improve the effectiveness of the criminal justice system. 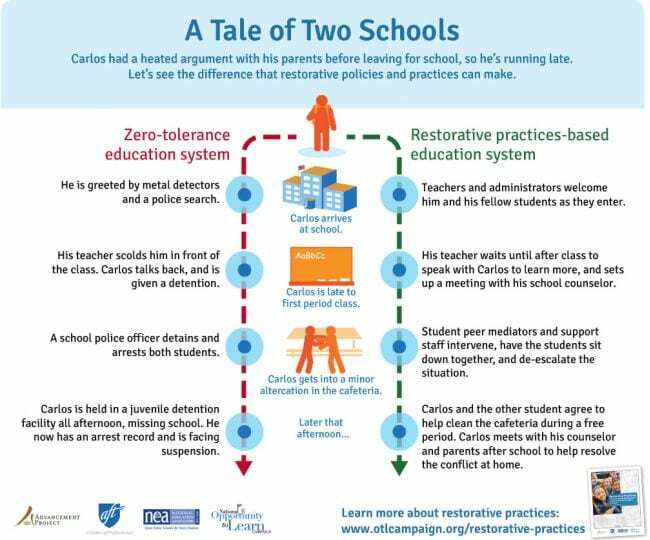 Within a few years, the success of these programs led to the exploration of restorative justice in schools, especially those that suffered from high rates of student misbehavior. In California, Oakland Unified School District began using the program at a failing middle school in 2006. Within three years, the pilot school saw a decrease in suspensions by a whopping 87 percent, with a corresponding decrease in violence. 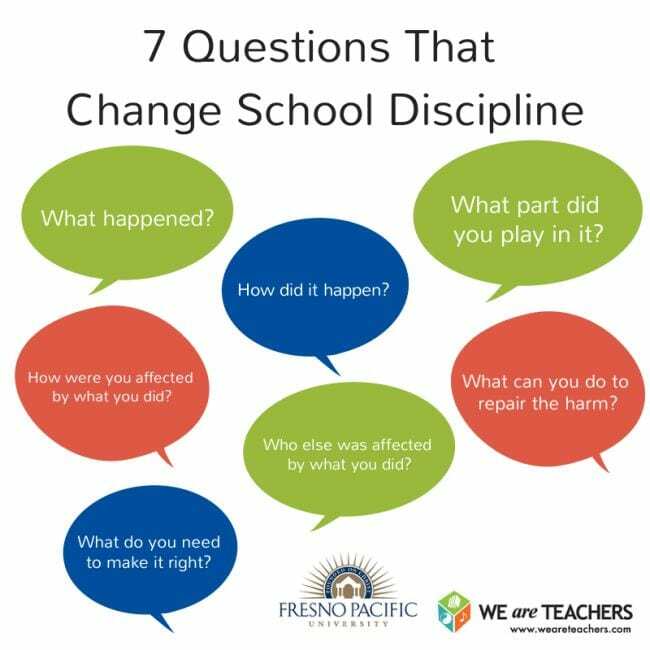 The practice was so successful that by 2011 OUSD overhauled its system and made restorative justice the new model for handling disciplinary problems. “Restorative justice is a major cultural shift from a punitive model to a restorative model,” notes David Yurem, OUSD’s first program manager of restorative justice. What are the basic practices of restorative justice? The program is based on respect, responsibility, relationship-building, and relationship-repairing. Schools like OUSD use a three-tiered approach. Tier I focuses on building a strong community within the school, laying the groundwork for responsibility and respect. 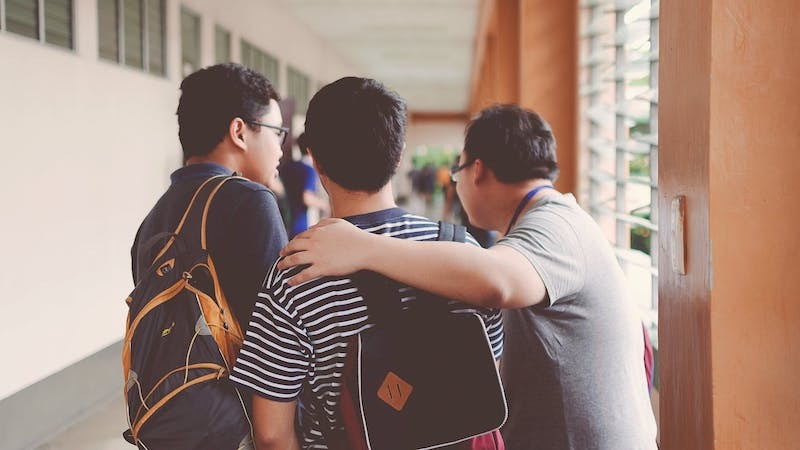 Tier II attempts to resolve conflicts and heal the harm students cause, while Tier III supports students reentering the school community after a suspension or expulsion. It also provides individualized support. The first tier is all about community-building as a preventive measure. Teachers or peer facilitators lead students in circles of sharing, where kids open up about their fears and goals. “The circles are based on indigenous practices that value inclusiveness, respect, dealing with things as a community, and supporting healing,” Yurem explains. “Kids really resonate with this process. I’ve seen kids share things that I was extremely surprised by, like eighth grade boys talking about what scares them. To seem weak in their world is a life-threatening thing, so I was really impressed.” This is the foundation for restorative discipline. Tier II comes into play when students break rules and someone has caused harm to someone else. In traditional justice, this is when punishments are meted out. Restorative justice instead turns to mediation. The offending student is given the chance to come forward and make things right by meeting with the affected parties and a mediator, usually a teacher. Tier III aims to help kids who’ve been out of school for a while due to suspension, expulsion, incarceration, or truancy. Returning to school life can be a real challenge in those cases, and many students in traditional environments quickly re-offend or drop out again. 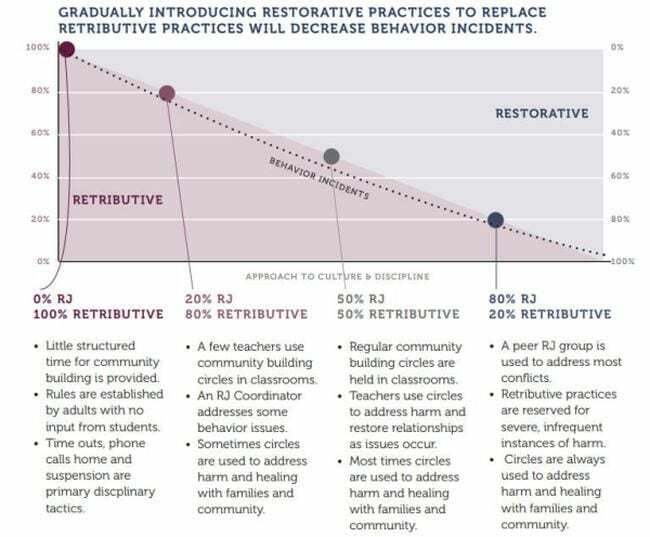 Restorative justice practices seek to reduce recidivism by providing a “wraparound” supportive environment from the moment a student returns to school. It acknowledges the student’s challenges while promoting accountability and achievement. Does it really work in a classroom? So what does all this look like in a real-world school or classroom? Roxanne Claassen was one of the first teachers to try restorative justice in school. She’d seen the success her husband, Ron, had using it in his work with the juvenile criminal justice system. Roxanne decided to try the model in her Fresno, California, elementary school classroom. Claassen worked with students to write a respect agreement. Together they determined how they would treat each other to create a positive classroom community. If a student violated the respect agreement, Roxanne would remind the student of the agreement and ask them if they wanted to honor it. Ninety percent of the time the student did, and the problem ended there. If the problem continued, Claassen worked together with the student to try to find a solution. “You say, ‘Here’s the problem. What can we do to fix it?’ The message you’re sending the child is, ‘I’m not against you; I’m for you. I want you to succeed,’” emphasizes Claassen. One of the students couldn’t afford to pay to replace the dispenser, so the student himself suggested that he could work with the custodian to pay his debt. He enjoyed it so much he continued to help the custodian long after he’d finished his restitution. If you’re thinking that implementing this kind of program in schools is a lot of work, especially up front, you’re right. But many teachers and administrators who use restorative justice say the benefits far outweigh the effort. 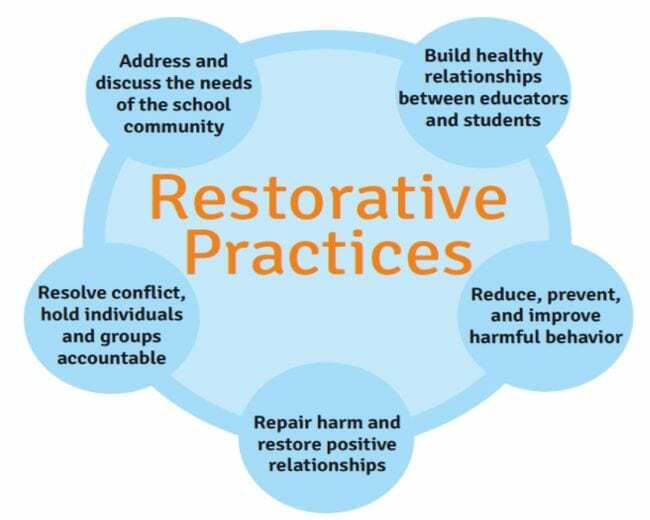 Statistics show that using restorative practices keeps kids in school. Punitive systems often remove students from the classroom, even for minor offenses. With restorative justice, everyone works together to keep kids in the classroom where they can learn. Children who are expelled from school often end up in what education reform activists call the “school-to-prison pipeline.” Restorative justice wants to stop this cycle and keep kids on track with their education. What are the drawbacks to restorative justice? For restorative justice to work, it requires engagement from all involved parties. For instance, if the offender isn’t willing to take responsibility for their actions and work with the victims to make meaningful restitution, there’s nothing restorative justice can do. Schools using this system find they still need traditional disciplinary actions available for circumstances like this. More than this, restorative justice in schools requires a pledge of time and money from the district and its administration. There are multiple examples of schools that set aside funds to implement the program but leave the money unspent. Other districts encourage teachers to use restorative justice, but provide little or no training or support. And some teachers are just leery of devoting themselves to yet another new program that’s supposed to solve all their problems, when they already have enough on their plates. Schools that dedicate themselves fully to the system, like Oakland USD and Chicago Public Schools, see real change and benefits. But the time, money, and enthusiasm required to make it work can be prohibitive for others. How can schools implement restorative justice? On their own, teachers can use some aspects of the restorative justice system in their classrooms. Respect agreements are a good place to start, giving students a stake in making the classroom successful. Teachers who want to implement sharing circles or mediation for misbehavior should spend time learning more about the process (see resources below). School-wide or system-wide restorative justice takes the full commitment of everyone involved in the education process—teachers, administrators, students, and parents. Schools can spend months or even years fully rolling out a program. It’s not the right option for everyone, as it requires extensive dedication of time and money. Teachers interesting in bringing restorative justice to their schools should talk with their administrators and work together to explore the process. 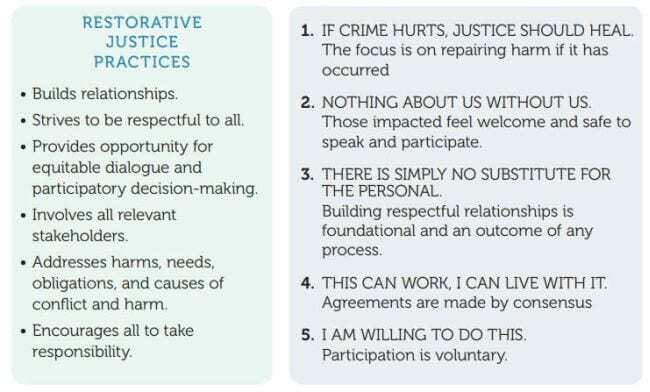 Oakland USD offers a particularly useful Restorative Justice Whole School Implementation Guide that provides a comprehensive look at what it takes to make it work. Get additional restorative justice resources. Does your school use restorative justice, or are you looking to start? Come join the WeAreTeachers HELPLINE group on Facebook, and chat with other teachers about your experiences. Want to learn more classroom management techniques? Check out our guide, What is Classroom Management?